Warmer air surges into the region today thanks to strong south flow coming up the backside of high pressure. This south flow will also bring moist air north ahead of our next weather system that impacts the rest of the week. Temps today should be 10-15 degrees warmer than yesterday in many parts of Ohio. Sunshine dominates, although we may see some offshoot clouds from Michigan and southern Ontario in far northern parts of the state from time to time. It should not be a big deal. Tomorrow we will see clouds move back into the region, and those clouds can trigger some scattered showers or thunderstorms. The action tomorrow is somewhat hit and miss and may end up being more of a factor in far NW Ohio, Indiana, influenced by a disturbance that meanders through the Great Lakes today. Still, though, we don’t want to get too cute with the forecast tomorrow. At this time, we think moisture tomorrow will be limited to 40% coverage. However, it is just the beginning of a much wetter period. On Thursday we have rain and thunderstorms spreading across the state with the potential for some strong to severe weather Thursday night and Friday morning. 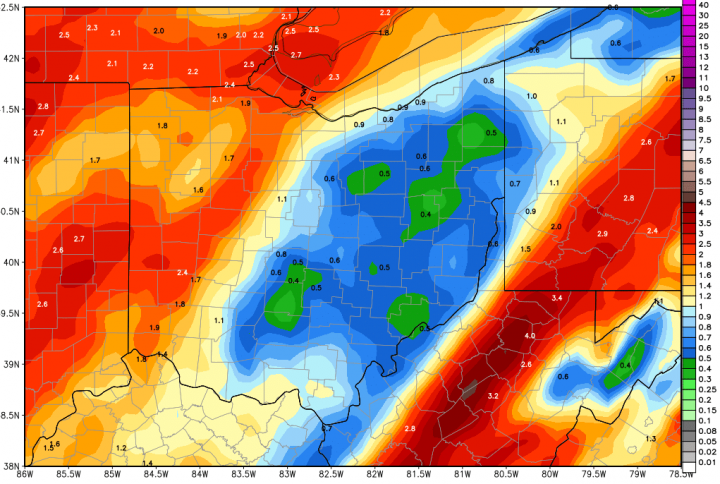 The heaviest rains come in that Thursday night into early Friday morning period, particularly from near midnight through sunrise, and we may see a couple of waves of heavy rain and thunderstorm action in central and southern Ohio. Showers linger through the balance of Friday and Saturday, but with much lighter intensity and lower coverage. On Friday, lingering showers can bring a few hundredths to .5” to 70% of the state, while Saturdays action triggers a few hundredths to .25” over 60% of the state. Overall, rain totals from tomorrow through Saturday early afternoon will be from half to 1.5 inches, and we have concern about rains over 2” in a few parts of the state, especially west central and NW Ohio. The map at right shows storm total precipitation potential through Saturday. We turn out partly sunny on Sunday and see a mix of clouds and sun on Monday, with temps near normal. The rest of our forecast for the 10 day window is unchanged, with rains returning next Tuesday, spreading across the state from NW to SE. We end up with 75% coverage over the state for Tuesday with rains of .25”-1”; thunderstorms are likely. Then Wednesday we see rains concentrate more on the southern half of the state, with a few hundredths to .4”, mostly from I-70 south. Again, no significant drying there. We have a couple of tweaks to the extended period. Dry weather still is in to start for next Thursday and Friday, but rains are looking to redevelop sooner, for the following weekend, and then on and off rains are likely through the turn of the month. Daily or event totals are not large, a quarter to half an inch, but with the new look at frequency in these rains, we still look to see limited drying into early May. The one thing that may be helpful in the extended period is that coverage of the rains may be closer to 60%…allowing for parts of the state to miss out. Those will be the areas to watch as we move forward, because we anticipate the need to adjust and change out look at the turn of the month in coming forecasts.